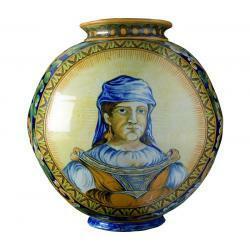 The collection of ceramics exhibited at Palazzo Ciacchi gives prevalence to XIX century majolica, illustrating the eclectic historicism of the second half of the century. 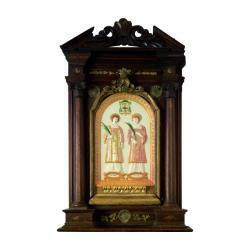 All exhibits belong to the Vittoria Toschi Mosca collection, mostly from Pesaro, Gubbio and Naples, towns to which Marchesa Toschi Mosca was connected by family ties and real estate. In the section dedicated to Pesaro are three amphorae and two black slave boys, objects conceived on a grand scale to adorn the residence of the marchesa. The amphorae made in Pesaro between 1875 and 1885 narrate events from mythology: the Hebrew warrior Joshua in the act of stopping the sun as he conquers Palestine, the Judgement of Paris, and a procession of marine divinities. The two black boys who probably held trays, dated between 1870 and 1885, are in typically ‘exotic’ taste and are from the Nicoletti & Compagni workshop in Pesaro. 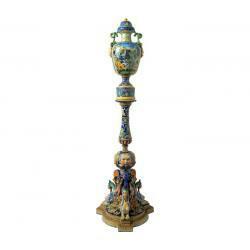 The influence of Venice is clearly evident in the group of majolica exhibits considered to be from either Campania or Calabria. These are two large globe-shaped vases, and two albarelli or chemists’ storage jars. Both types are decorated with half-busts of soldiers in different poses, surrounded by leaves and flowers on a blue background. One vase is decorated differently, with a young man and woman, both in traditional local costume. These ceramics can be dated between 1850 and 1885, the year of Marchesa Vittoria Toschi Mosca’s legacy to the municipality of Pesaro. 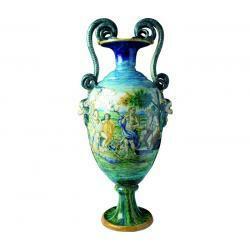 The majolica of Neapolitan origin in the possession of the Municipal Galleries forms part of the Mosca legacy. Marchesa Mosca owned a villa in Naples which she may have acquired in order to maintain contact with the city of origin of her grandmother, Princess Beatrice Imperiali. The Palazzo Ciacchi section includes five items with zoomorphic elements and decorations in relief. The pair of amphorae have zoomorphic handles, rest on circular pedestals and have battle scenes at the centre. The two boat-shaped vases stand on zoomorphic feet and have female figures at each end. The imposingly modelled amphora on a triangular base has decorative motifs in relief. All the objects can very probably be attributed to Gaetano Battaglia at the workshop of Raffaele Mosca e C., and were made between 1850 and 1885. With Pesaro and Naples, Gubbio is one of ‘Marchesa Mosca’s towns’. Since the XV century, this Umbrian town has owed prestige and fame to its lustre ware. Lustre is produced by a particular process giving a special metallic sheen to ceramics. The lustre majolica exhibited here was made in Gubbio. The two plates and dish with decorations typical of Gubbio are probably by Giovanni Spinaci. The attribution of the tray with boss is uncertain, being either by Giovanni Spinaci or from the Società Fabbri e Carocci. It is to Antonio Passalboni, a ceramist working in Gubbio during the second half of the XIX century, that we owe the plaques of religious subjects, as follows: tabernacle with Madonna and Child gracefully depicted in landscape; tondo representing the Madonna of the Chair; altar with columns and a tympanum broken by a frieze incorporating a tile on which Saints Marian and James can be identified.